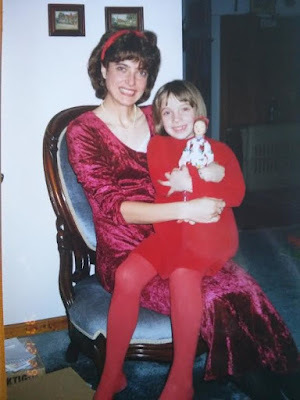 For today's Throwback Thursday post, I wanted to have a picture of me and my mum! Judging by all the red we are both wearing, I'm guessing this picture was taken at my grandparents house over the Christmas holidays. The doll I'm holding must have been a freshly opened gift I imagine! I was very lucky to have my mum drive up from Kingston yesterday morning to spend a few hours here in Ottawa with me and Ryan. After she arrived, we had some tea and chatted a bit while we unpacked some of the things she had brought up for us. My mum is really quite skilled at sewing, so for as long as I can remember, I've gone to her for anything sewing related! Given my affinity for fashion design, I've had my mum's help with sewing on many, many occasions! look before the big day! The project my mum came all the way to Ottawa for was particularly special, since it has to do with my bridal outfit for next Friday! 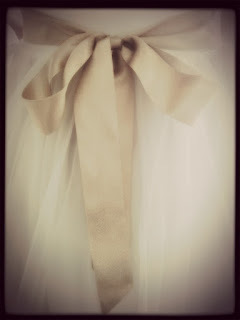 Rather than buy a pre-made bridal belt, I wanted to do a DIY project and pick out the sash color and embellishments myself. I can do a few basic stitches, but without my mum and her sewing skills, I can honestly say, my bridal belt would never have turned out! Along with sewing my bridal belt, my mum also brought up my bridal skirt, which I am SO excited about! I ordered it online so I wasn't sure about how it would actually look in person, but I was not let down at all! Even though it was only a short visit (mum left at 2 pm to drive back to Kingston), it was a really lovely way to spend the morning! I love that we live fairly close to both my parents and Ryan's parents, but it's still such a treat when we actually get the chance to spend time together! Getting my bridal outfit ready with my mum was really special to me and I am so happy we were able to do it together!